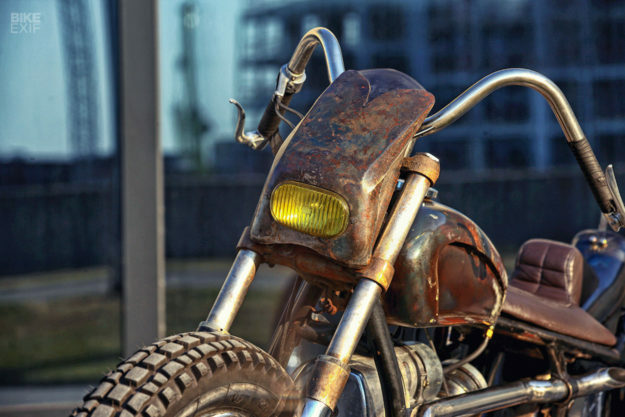 People come across bikes in the most unusual ways. We see barn finds, family hand-me-downs, and even the occasional generous gift from a stranger. 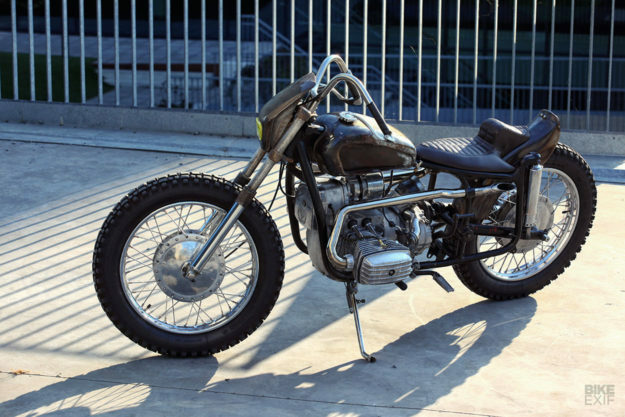 But this weirdly appealing 1970 Dnepr rat bike has one of the strangest tales of all. 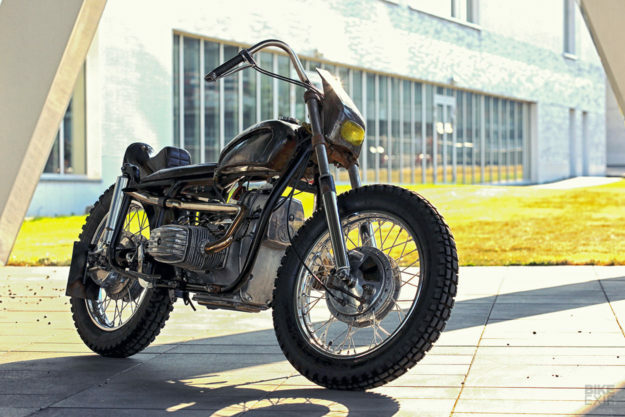 It now belongs to Belgian Nick Heij, who lives in Antwerp—some 2,000 kilometers away from the factory in Kiev where the Dnepr was built. Nick agreed, parked the Dnepr in his garage, and helped the Russian work on the bike. But eventually the visits from the Russian slowed down, and stopped. The Russian offered the bike to Nick for the same price he’d paid for it. “But it’d been standing at my place for a year and I’d worked on it, so I gave him a ‘take or leave it’ offer,” says Nick. Somewhat aptly, he’s called it Baboesjka, the Dutch term for Russian babushka nesting dolls. For those not familiar with Dnepr, it’s a marque with a similar history to Ural. 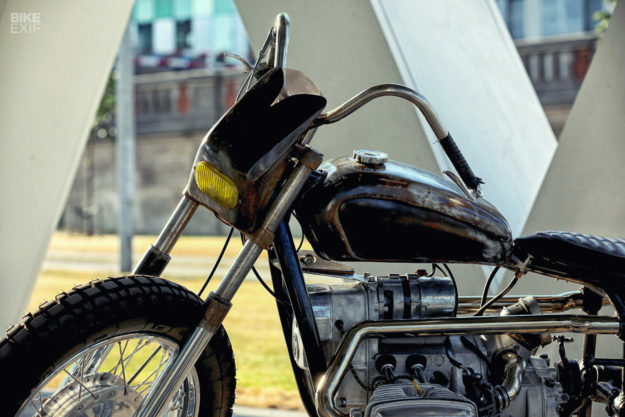 The bikes can trace their roots back to the BMW R71 (and the Soviet M-72 copy) but were built in Ukraine, and the engine casings have a much more angular look to them. Nick’s given the engine a complete overhaul, using new Schaeffler bearings, BMW R60-spec pistons and rings, and valves and springs from a Ford Fiesta. (Yes, really.) This should restore horsepower to somewhere in the mid- to high-30s, helped by a new BMW ignition coil. 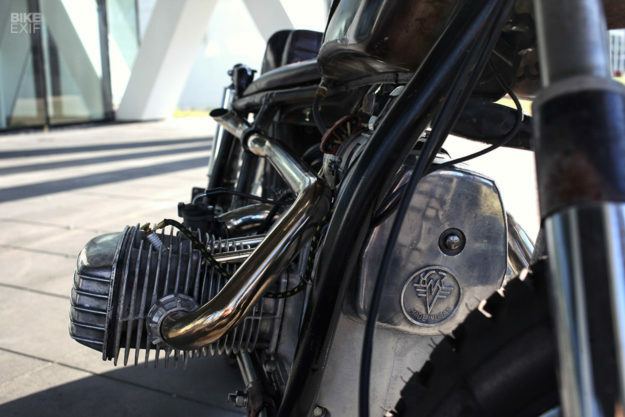 The heavy stock exhaust system is gone, replaced by simple stainless steel straight pipes, with the frame slightly adjusted to hold them in place. Nick has built new stainless air intakes for new Dell’Orto PHBG carbs too: “The original carbs are good for 5,000 km and then you need to replace them!” The ‘airbox’ is actually an old, recycled alternator cover. 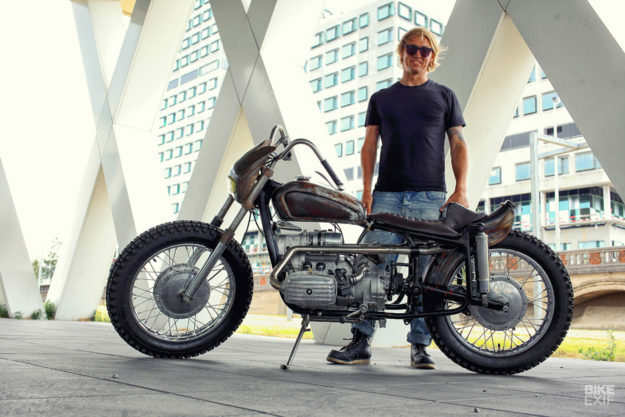 Nick’s also raised the gearing to give a slightly higher top speed, since the engine is relatively torquey—and in 21st century Antwerp, the bike is not likely to be plowing through mud in first gear. 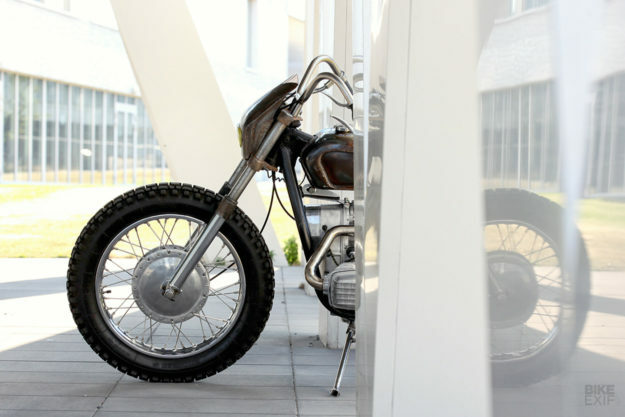 The tank is from a small Motobécane, which Nick had lying around in his garage. He’s matched it to an its-bitsy bikini fairing with a 1970s style rectangular Hella lamp. The stainless bars are custom too, with internal brake and clutch cables to keep the front end uncluttered. 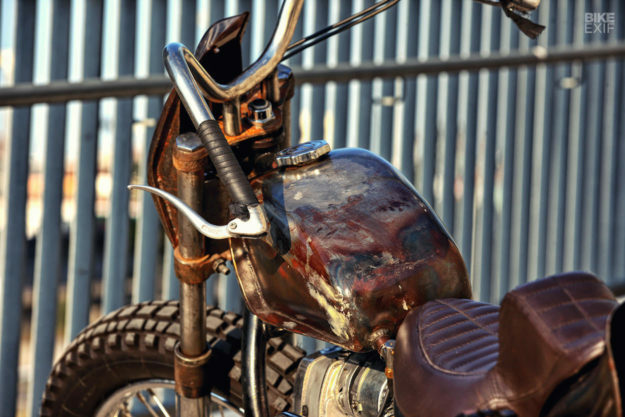 There’s a one-off leather seat and fender, with a nod to the ‘crazy frank’ chopper style. Nick reinforced the Dnepr’s frame under the seat, modifying it to take a small box for the electrics. 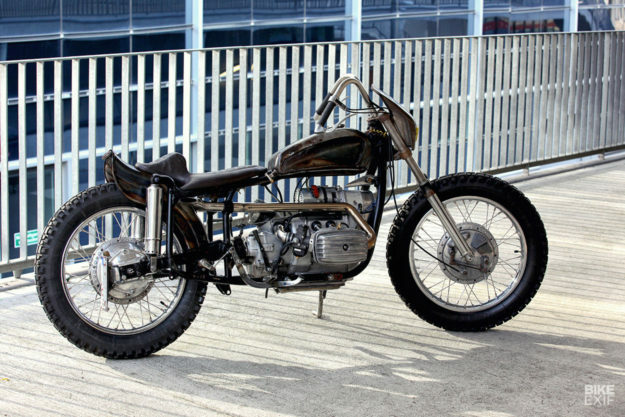 He then narrowed and shortened an old Harley rear fender to fit, and shaped the seat pan and foam before giving it to his friend David Thys to complete the upholstery. 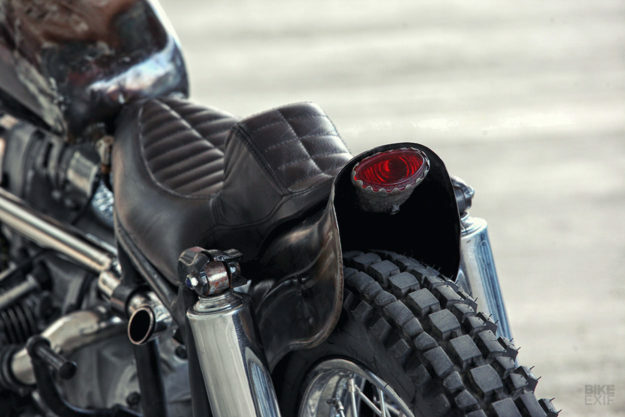 The small rear brake light is from a WW2-era military-spec Harley-Davidson WLA. 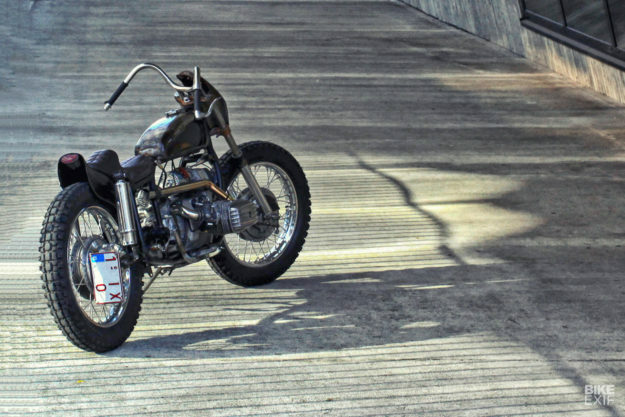 The chromed, sleeved shocks are from a later Harley FL and Nick has fitted new 19-inch rims shod with Heidenau K37 tires—a vintage-style dual sport option popular with owners of older Urals. This Dnepr is not going to win a trophy at the Quail Motorcycle Gathering, and it’s never going to get a megabucks studio shoot for a glossy magazine. There’s not an LED in sight, either. But it’s an honest machine with curb appeal by the bucketload. 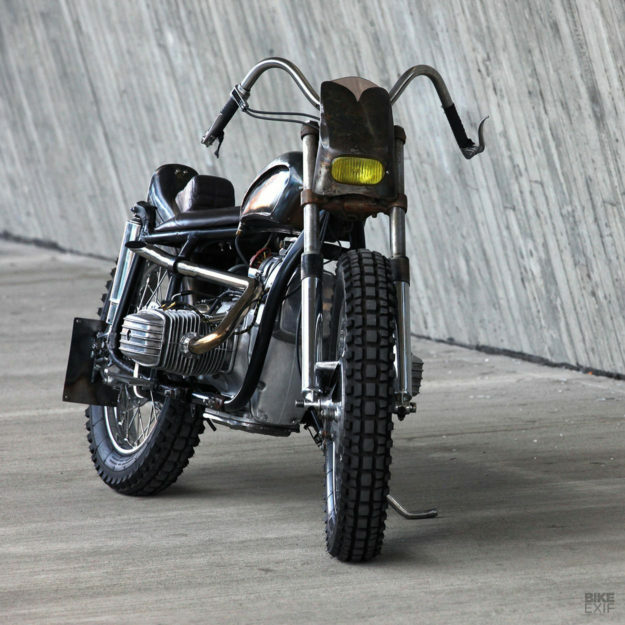 Is it time we had a rat bike revival in the custom scene?